Sanwari Women Empowerment : Sanwari Women Empowerment in association with ‪Max‬ ‪HEALTHCARE‬ HOSPITAL SHALIMAR BAGH . Sanwari Women Empowerment in association with ‪Max‬ ‪HEALTHCARE‬ HOSPITAL SHALIMAR BAGH . 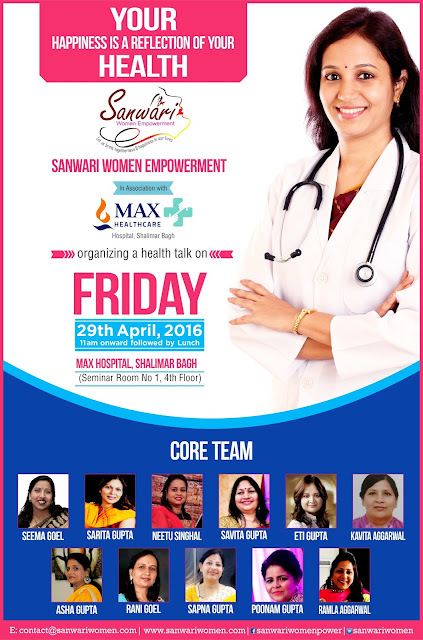 Your Happiness is a reflection of your health, Sanwari Women Empowerment in association with ‪#‎Max‬ ‪#‎HEALTHCARE‬ HOSPITAL SHALIMAR BAGH . Buddha is cooked-up by Satan. (ever see that movie? SAW? Exactly what Hell shall be like.